Why 9? Well, the question was… since those pike pushups are around 75% intensity of full bodyweight, and the 1RM (1-rep-max) table says you need to be able to do 9 reps of something at 75% intensity to potentially exert 1-rep at 100% intensity, will I be able to do one clean, proper handstand pushup if I can do at least 9 of these pike pushups with perfect form? That was the test. So I did pike pushups almost everyday for 6 weeks to get to those 9 reps. Initially it was simply a matter of getting used to the exercise and it was great that I was doing it so often. It felt truly difficult pushing in that vertical direction and it was quite humbling overall as to how difficult the true HSPU must be. In just 6 weeks, I tripled the volume! Each day, I simply add only one rep to only one set of the previous day with ample rest (5-60 minutes between each set, usually about 5-15 minutes). I also log my rate of perceived exertion (RPE) on a scale of 1 to 10 and any other notes. 11/1: 5, 4, 3, 3, 2  18 reps, felt easy peasy. Notes: Initially I noticed I cant even push out of this move FAST when I try to explode up. So, hopefully in a month that will be very different. Already 8 training days in and it’s starting to feel really easy as the nervous system is able to fire up the muscles in coordination. There’s a saying that strength is a skill and it definitely is, especially for a lot of these compound bodyweight exercises as they are somewhat technical and the body needs to work it repeatedly, like a skill, to refine it and be able to execute it easily. Final notes: In those 6 weeks I got very good at doing pike pushups and developed the ability to push faster, too. Also, in the first couple weeks, if I was going to fail a rep, I would put a foot down abruptly to stop. But as time went on and I got stronger, I found myself being able to grind through some really difficult reps without letting my feet drop. So after I achieved that, the time came to test if I could do one HSPU. What were the results? Not really a success, but not really a complete failure either considering this was only one training cycle in just 6 weeks. I was able to do 1 rep with bad form. Then, a clean negative but couldn’t press out of it. And then a couple partials which felt really good. So I couldn’t muster up a clean, proper HSPU yet from this single training phase, but I am very close. I feel stronger than ever and the negative felt super solid and I knew I could push back at any earlier point. It’s that final point where the nose boops the ground where it’s hardest. Note that, I’m also doing my darndest to make sure my forearms never move backwards. 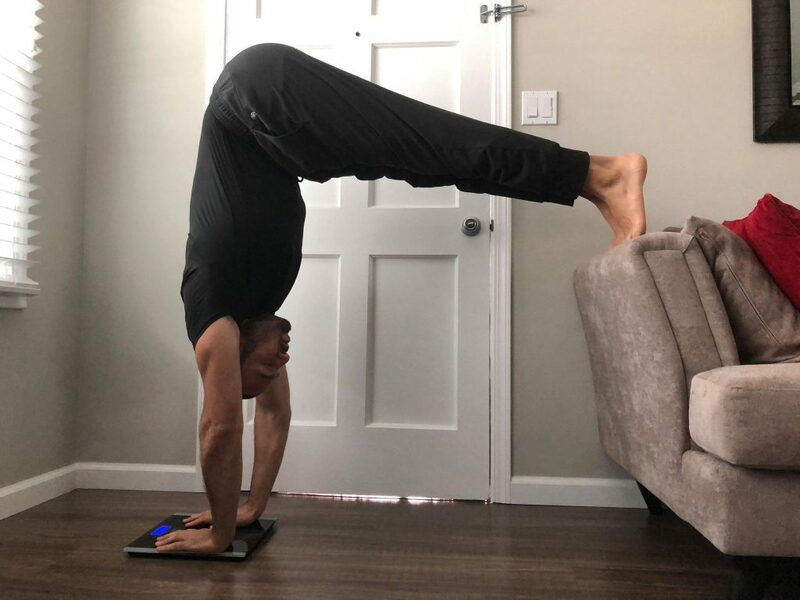 Also, if my hands were further away from the wall, it would’ve been much easier probably, but I’m doing it with my hands close to the wall because this mimics the true HSPU. So what now? More Pike Pushups? Do I do more reps of pike pushups with the feet at the same height? Nope, I’m way too bored of this exercise already. Do I do partial-ROM HSPU and increase reps/range? It sounds nice but a failed rep would mean my head hits a wooden yoga block. Do I raise the feet up higher to increase intensity and build the reps up? Fun Fact: With feet at hip height, it’s 6-7% harder than when my feet are at knee-height. I thought 6% was not going to be a big difference, but the exercise felt significantly more difficult. The decline blocks elevate my hands by 1.5″ which results in a solid 13° increase in range due to the elbow angle bending further! So according to the 1RM calculator table, at 83% intensity, I might be able to perform at least one HSPU if I can do 7 of these pike pushups. 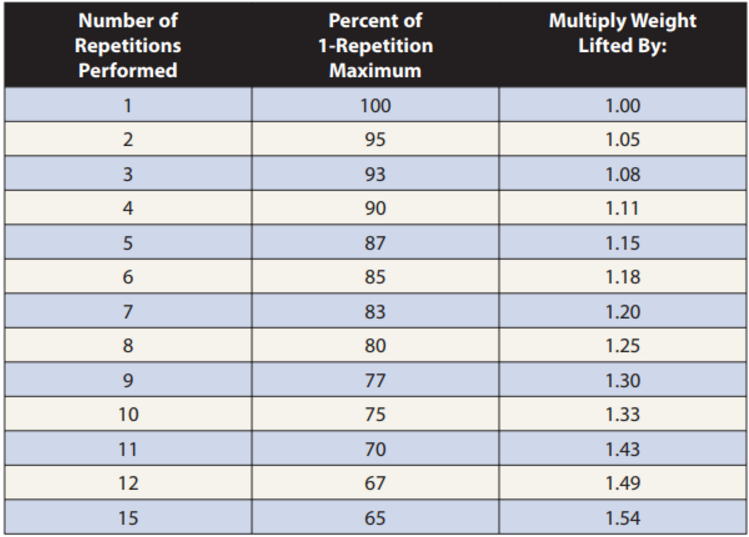 Source: NSCA’s calculations from their book Essentials of Strength and Conditioning 4th Edition. With this new, more difficult setup, I had to find out how many sets and reps are appropriate. I figured it’s only 6-7% harder so I could do close to what I was doing before… so I started with 7, 6, 5, 4, 3 (25 reps) but I could feel it was extremely difficult and the next day I couldn’t even perform the same number of reps. So that was a blow to my ego because I started with too high of a number. Plus, I noticed I was feeling a bit burned out from doing pike pushups for nearly everyday for 6 weeks. When you notice you have a lack of motivation and feeling more tired than usual, it’s a sign of overtraining, so I took a long break for three weeks which coincides with the holidays, until the new year came up to get reinvigorated with it naturally. ^ This lack of willpower was a sign of burn-out creeping in so I took 2 weeks off, which coincided with the holidays anyways. Goal: Get to “7,6,5,4,3” reps and test if I can do one HSPU. It’s been exactly two weeks and in another week I’ll be at my goal of hitting 7 reps with these new pike pushups. If that’s not enough, then I will probably go until 9 reps and then test again. We will see. I’m trying to keep the exercise selection to a minimum to see what has the most direct approach with the least number of changes. In conclusion, in 6 weeks, I tripled the amount of pike pushups I could do with the feet elevated at knee height. 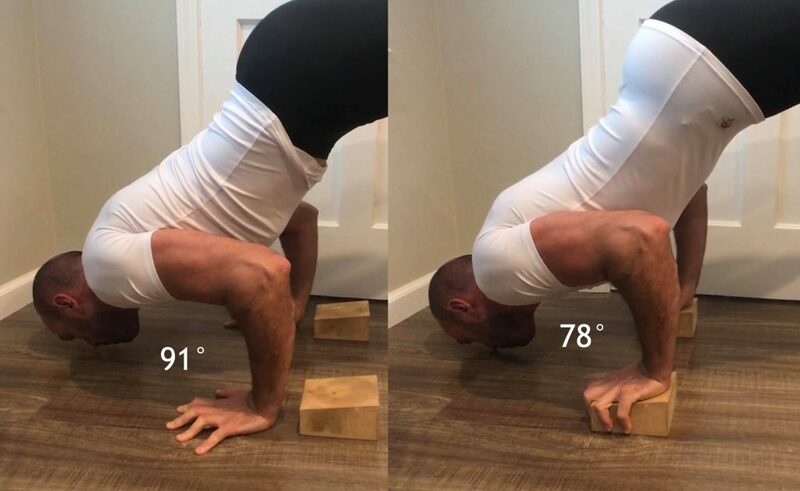 When I got to 9 reps, I tested to see if I was strong enough to do a single HSPU. I wasn’t, so I continued the pike pushups, but with the feet higher up, making it about 7% more intense. When I get to 7 reps of that, I will test to see if I can do one HSPU and then this experiment will be over. But the journey never ends and by that point I’ll have a goal of hitting at least 5 HSPU’s, which I will probably methodically document as well! Update: Here’s Part 3 of this HSPU Journey!